If there is one thing I love about the ITC brand, it is its constant endeavor to bring our rich culinary heritage to the fore. Of course, they are a formidable name in sustainable premium hospitality sector too, but that is for another time and another discussion. Under the umbrella of the "Kitchens of India" ITC puts together food festivals from parts of the country and communities that are not often in the limelight. At the helm of these festivals are proficient culinary experts, well respected for their work and knowledge in the cuisine. Currently on at the ITC Windsor Dakshin, is the Moplahs of Malabar festival, on till September 12th. 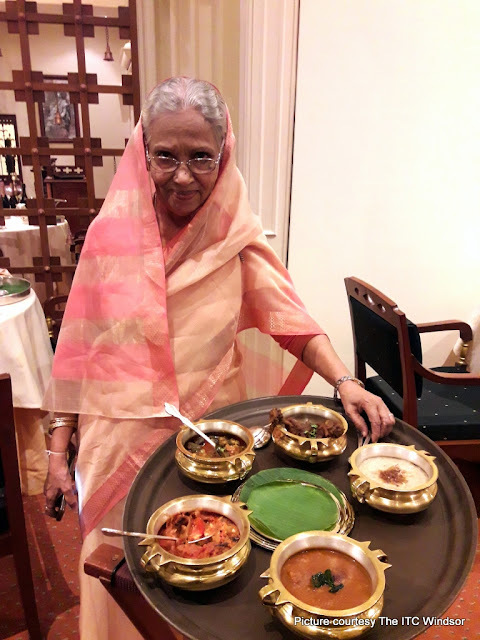 At the center of all this wonderful Kerala Muslim food is Ummi Abdullah, well into her 80s, yet elegance personified as she visits every table that is served the food she has created. Moplah food is immensely influenced by Yemeni elements, thanks to a history of traders coming into the region of Northern Kerala where this food originates from. We were invited to a tasting of the extensive menu and braced ourselves for what we knew was going to be a long evening of good food and indulgence. As we settled ourselves down, we were brought a basket of papads and crisps, typical to an Indian meal with classic Dakshin chutneys of tomato, coconut and coriander. They always make for the best munchies while you wait for the parade of food to begin. Also accompanying these crisps was a pleasant and refreshing drink of coconut water and mint. We began the meal with Kozhi Ada - a savoury chicken deep fried pocket of goodness, with fennel coming to the fore. The caramelized onion version makes a great vegetarian option. Next up was the Meen Porichathu - seer fish slices coated in what looked like a fiery red masala, but which was, as Ummi explained, a mix of ginger, garlic, chilli, salt and fennel. The basis of most masalas in Moplah cooking she explained is fennel, which gives the food a distinctive taste. The freshest of seer fish, combined with a mild masala and pan fried just enough to have soft flaky fish on hand, is brilliant. One of the first dishes from the main courses that came our way was the Alisa - a wheat and mutton porridge preparation which looks very similar to the haleem, but is a lighter (thanks to the lower meat, higher wheat proportion), made fragrant with caramelized onion and a light hand on the ghee. This is the dish that you will go back for, all through your meal and then, if you are like me, post dessert too. 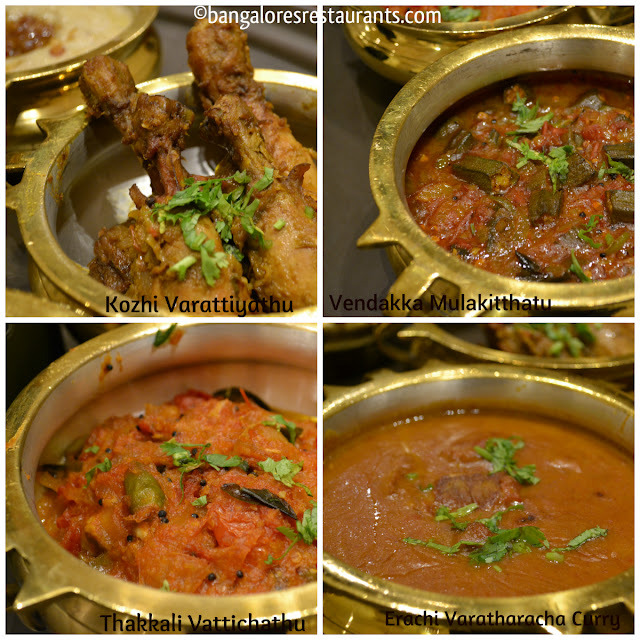 Each of the main courses were distinctive in their flavours. The Kozhi Varattiyathu with onions and fennel paste rubbed on chicken drumsticks is mild, yet very flavourful, with a strong punch from the fennel. Both the Vendakkai Mulakitthatu (Bhindi Masala) with a touch of chilli and Thakkali Vatichathu (Tomato Chutney/Gojju) had distinctive tangy flavours, pairing very well with the pathiri. The Erachi Varatharacha Curry (Mutton Curry) is quite typical of a Kerala style mutton curry that is coconut based. What better than to end your meal with the Thalassery Mutton Biryani - made with a masala so light that you would be surprised how it comes together with soft mutton to make a wonderful biryani. This one is made with jeera samba rice and is finished off with caramelized onions. You don't really need a raita or an accompaniment to go with this one. And for dessert, though the Mutta Mala and other such wonderfully Moplah offerings were there, we had the Pazham Pori - batter fried bananas to wrap the meal up with. A fabulously indulgent meal this is. Through most of the meal, Ummi reminisced about her food memories and one such was how her grandmother would never consider purchasing coconut oil for cooking. Rather she would painstakingly make it - right from scraping coconuts to squeezing out the milk and then heating it till the oil separates. Also at our table was Ummi's sister B M Zuhara, a well known Malayalam author in her own right who gave us some wonderful insights into a forward thinking community and its history. The festival is currently underway and on till September 12th. The Moplah Thali is priced at Rs 2300++ and it is one that will leave you with some wonderful food memories. Don't forget to take some of the fragrant jasmine on offer at the reception table.